We entertained our neighbors with a seafood dinner. 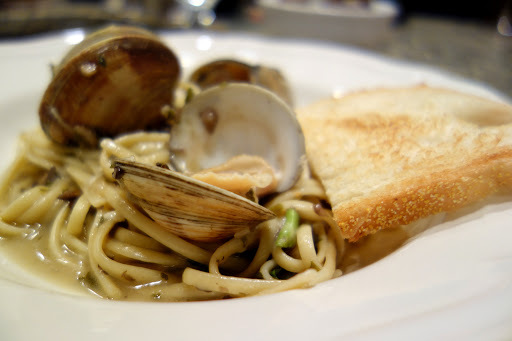 The menu consisted of Sicilian calamari for an appetizer and linguine with clam sauce for dinner. 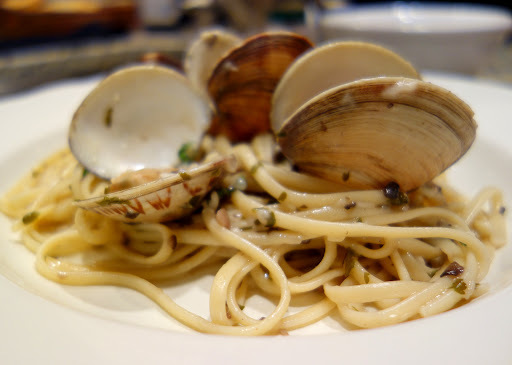 Linguine with white clam sauce is a staple food item in our house, but I’ve never actually made the white clam sauce myself (I used the canned sauce). I’ve stayed away from cooking fresh clams because they always intimidated me. But as with most things that intimidate us, it was far simpler and easier than I imagined. 1. Remove sand from the clams by covering them with salt water (1/3 cup salt to 1 gallon of water). After sitting in the salt water for a few hours scrub each clam thoroughly with a rough brush on both sides. I let the clams sit in the salt water while I made the clam sauce. I drained and scrubbed them just before they were ready to cook. 2. In a saucepan sauté your mushrooms with 2 tbsp. olive oil for about 5 minutes over medium heat. Add a pinch of salt to help the mushrooms release their juice. Add the diced onion to the mushrooms and continue to sauté for an additional 5 minutes or so. Add the dried parsley and oregano. 3. Add 2 cups of white wine, I used Sauvignon Blanc but any dry white wine will do. Crush about 3 cloves of garlic and add it to the mixture. In a side dish or measuring cup combine the flour and 2 cups of chicken broth. Beat the flour and broth until homogeneous and add the mixture to the sauce. Stir the sauce thoroughly, bring it to a light boil, and then turn it down to a simmer. 4. Add salt & pepper to taste. Add some crushed red pepper to give the sauce a kick. Simmer the sauce for about 10-15 minutes allowing the flour to thicken it slightly. Feel free to add more chicken broth if you want a thinner sauce. 5. Prepare your linguine pasta to package instructions. 6. In a wok (or any large pan) combine 2 tablespoons of olive oil, 1 cup white wine, 1 cup chicken broth, some crushed red pepper (optional), and 7 cloves of garlic, thinly sliced. Mix these ingredients over a high heat. Keep a lid over the pan to develop a lot of steam in the pan. Add the clams to the pan and cook them until they start to open (~7-10 minutes depending on how steamy it is), shaking the pan occasionally. 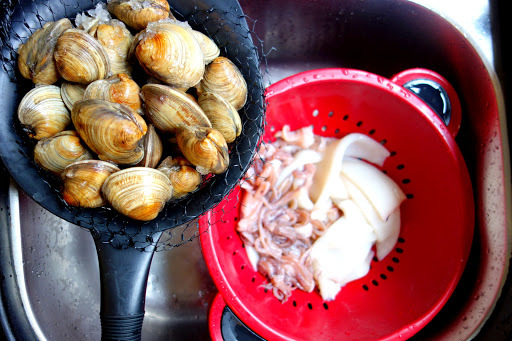 Don’t overcook the clams as they will become tough, they’re ready to eat as soon as they open. 7. 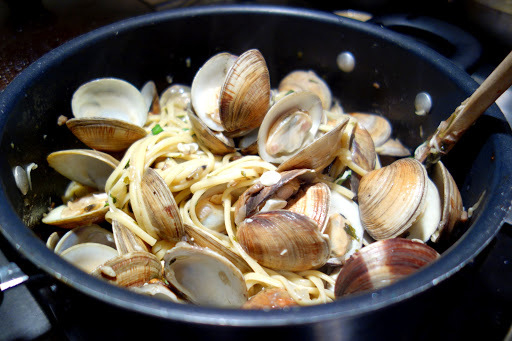 Once the pasta is ready mix it with the clam sauce in the same pot you cooked the pasta in. Add Grated Parmesan cheese and the chopped fresh parsley. Mix the sauce evenly over the pasta. 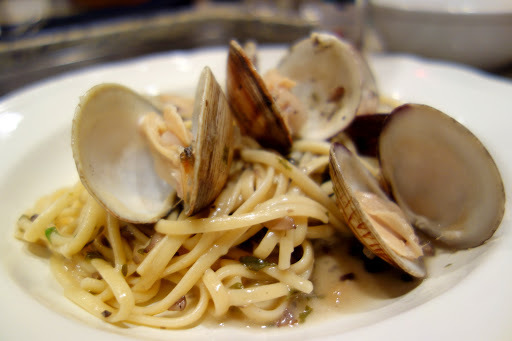 When the clams start opening up add them as they open to the pasta allowing the unopened ones to cook a bit longer. Discard the clams that remain unopened. Spoon as much of the sauce from the clams as you can into the pasta (be careful not to pick up any sand from the bottom of the pan). 8. Serve the pasta with garlic toasted bread. To toast the bread, preheat a pan over high heat. When the pan is very hot, lightly spray it with olive oil cooking spray (any cooking spray will do). Toast the bread on each side until it reaches a light brown color. Rub a garlic clove over the bread. This bread smells so good and is so delicious you will want to make a lot more than 3 slices of it. Leftovers store well in the fridge and might taste even better as the pasta soaks in the sauce. 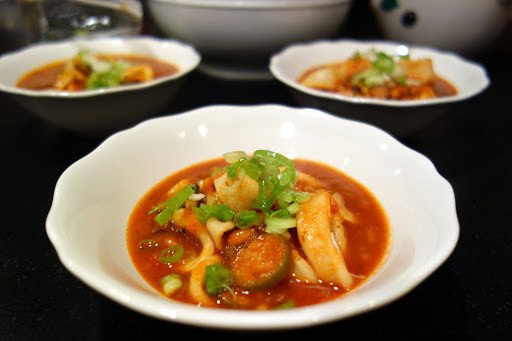 This entry was posted on March 21, 2013 by natalyaperullo in Food.